It has long become accepted that cycling is a great way to stay in shape, both physically and mentally. Still, not everyone has the luck to have great scenery and kept trails in their close proximity. So, what are you to do? Plan a bike trip and drive there, of course. Now, planning a bike trip is easy enough, since it’s more or less like planning a camping trip, and who hasn’t done that? But, there is one thing many folks overlook, and that’s how they’re going to get their bikes there. By car is an obvious answer, but the problem is much more complex and nuanced than squeezing the bike inside the car or throwing it onto the roof and then strapping it with bungee cords. You need something to protect the frame from damage, and this something is a bike rack. Roof mounted racks are ideal for sedans and hatchbacks with a low profile, whereas most other vehicles, from vans to SUVs will benefit more from a trunk mounted rack. RVs and motorhomes, as well as vans, may also profit from hitch and bumper mounted racks, and so can pickups. However, it’s a shame not to use the truck bed if you already drive a pickup, so having a bike rack that mounts on your truck bed is a perfect choice. Just so that you don’t have to bother with wading through the depths of the internet, we prepared a list of the top six truck bed bike racks, with an added bonus at the end. Thule is one of the major players in the bike rack niche, and bike industry overall, and Bed Rider XTR is definitely up to the game. The rack is made out of aluminum, with a telescopic bar at its core. In turn, the bar features soft rubber feet that hold onto the side rails of your pickup truck, which completely eliminates the need for drilling holes. In other words, it’s designed to go from bed rail to bed rail in the rear of your vehicle. Keep in mind, though, that the rack is not compatible with over-the-rail bed liners. Moreover, you also get 3 Thule One-key lock cylinders with your purchase, so that you can easily lock the bike to the carrier, and then the carrier itself to the truck. 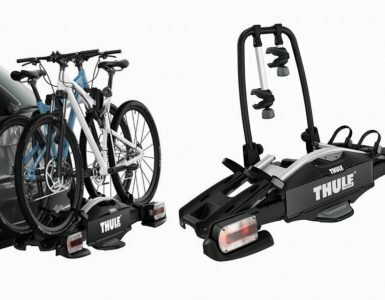 The maximum load is two bikes, or about 70 pounds, though you can mount additional bikes if you get the Thule locking bed-rider add-on block (sells separately). The rack is 53.2 inches wide by 7.8 x 2.8 inches. This means that it is exceptionally easy to store when not in use. Of course, the fact that it locks in position may be enough to persuade you that it never needs to be removed! It weighs just 9.6 pounds making it easy to manipulate and it won’t affect your fuel economy if left in your truck. While we’re on the subject of bikes, it’s important to note that this is a fork mount carrier, so you will need to take the front wheel off. If you have a large hub, such as a 135mm then this rack will not be able to accommodate your bike. Another important thing to note is that the rack is not compatible with either tandem bikes or recumbent bikes, but it will fit most bike types. Granted, you’ll still need a thru axle adapter, which sells separately. The Heininger Automotive 2025 Advantage SportsRack BedRackis a great choice for families or medium groups due to its capacity – it can easily hold up to four bikes. More importantly, perhaps, the rack is a wheel mount, meaning it doesn’t require taking the front wheel off. All you have to do is adjust the spacers to fit your bike snugly (accommodates any wheel up to 28 inches), secure them using the complimentary 72-inch cable, and finish it off by securing the rear tire using the aptly named securing bar. If you’ve followed these simple instructions to the letter, you’re good to go. The rack itself assembles in no time and locks to the truck bed without using any tools or drilling any holes. Simply secure it to the inner walls of your truck bed using the adjustable rubber stabilizers, twisting them into place with wingnut type screws. It is worth noting that the padding is exceptionally soft to ensure no damage is done to the paintwork on your truck when you fit it. This fitting system allows you to quickly install or remove the rack. Considering the size of the rack it is important to be able to remove it quickly when you need your truck. Everything you need comes with the purchase. Moreover, the rack comes with a spacer that allows it to be compatible with a great variety of vehicles, as it can extend from 54.5″ to 66.5″ (without the spacer) and/or 60.5″ to 72.5″ (with the spacer). It’s important to note, though, that the rack is not compatible with step-side pickups, so keep that in mind when shopping. You may be interested to note that this rack can actually stand by itself. This means that you can put it in your garage and slot the bikes back into it; all you need is enough space! 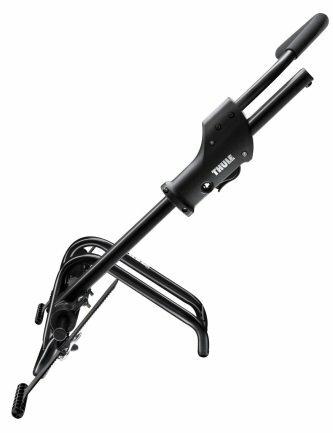 Much like we’ve grown accustomed to seeing from Thule, their 501 Insta-Gater Truck Bed Bike Rack (got to love their naming pattern) is a quality product, and with a price to match. Still, the rack does have the potential to pay for itself in the long run. It offers a great deal of protection which can reduce costly maintenance and damage repair bills. This is a single-bike carrier that can fit any bike weighing up to 50 pounds and sporting rims from 20 to 29 inches in diameter. Given it’s a wheel mount model, you don’t have to remove the front wheel, just make sure the tire on it is not wider than 3 inches and secure it using the Thule proprietary Quick-Load system. There’s no drilling or bolting required to mount it on your truck bed. All you need to do is place the carrier on your truck bed, making sure the rubber tabs are between the tailgate and the bed itself and close the tailgate. That’s it. Still, if you want to deter the five-finger-discount folks, you might want to invest in a lockable tailgate. As for anti-theft features on the rack itself, there’s a lock to secure the bike to the carrier, so you’re safe on that side. If you need to transport more than one bike, it’s good to know that you can fit up to three Insta-Gaters on tailgates with at least 51 inches in width. But, you need to take note that this bike rack will not fit on your truck if you have over the rail bed liners. Again, this rack is not suitable if you have a recumbent or a tandem. However, if you have a roll n lock bed cover which allows the Thule rack to sit on the bed lip without interference then you can still use this rack! 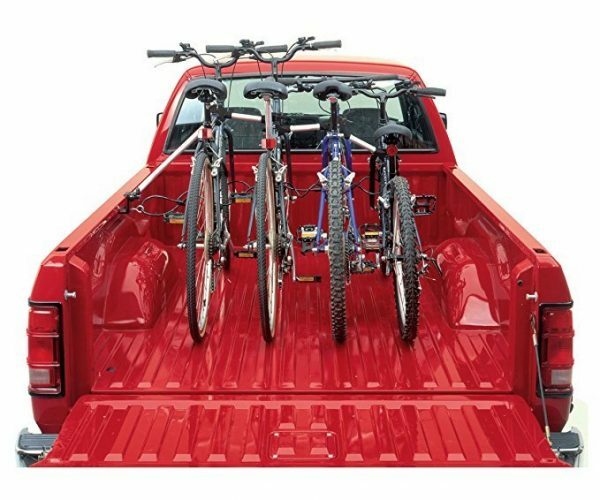 The very succinctly named Pipeline Racks Truck Bed Bike Rack is a nice choice for anyone who has a pickup with the truck bed at least 58.4 inches wide at the cab, due to the dimensions of the rack itself. This may feel a bit restrictive, but the rack more than makes up for it with the degree of stability it brings to the table (or, rather, bed). Like with most truck bed bike racks, there’s no drilling or bolting involved in securing it to the vehicle – the weight of the heavy-duty frame alone will take care of that. It weighs a reasonable 37 pounds. To secure it to the bed, use the straps and make sure they are fastened tight –and we mean tight. There’s some assembly required prior to installation, but the whole process should take you well under an hour. It is worth noting that this rack cannot accommodate a bike with full fenders. It is also not designed with children’s bikes in mind. But, it can accommodate most children’s bikes and will be useful as they trade up for larger bikes. There’s enough place for two bikes with this particular model. Depending on how and where you drive, you can expect anything from excellent to adequate performance. For most roads, it should be no problem, but you can expect some wobbling on bumpy or winding roads. It should accommodate any type of wheels as long as the tire width doesn’t go under .75 or over 2.8 inches. If you have 5 people in your family then it is worth noting there is a mode the same as this which can handle 5 bikes. 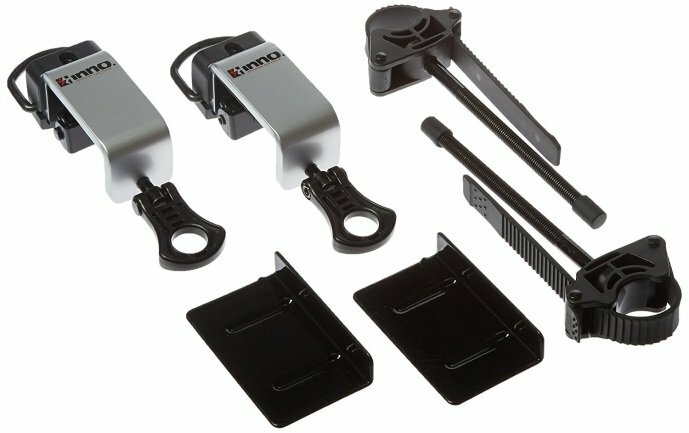 For those looking to find something that will help them transport their bike(s) using a pickup without sacrificing cargo space, there’s the Inno Velo Gripper Truck Bed Bike Rack. This rack is highly economical space-wise, as it mounts to your truck’s bedside rail without any tools or holes involved. What you get are two mounts (for attaching to the vehicle) with ratcheting holders and a couple of D-rings (on each mount) if you decide to use the mounts for attaching tie-down straps. This means that you can easily keep these fitted all the time to secure your bike and still maintain the important cargo space in your truck. In all honesty, this is not really a full rack as it’s a pair (yes, the listed price is for a pair) of grippers. There’s no need to get inside the truck to mount either them or the bike, and you can just as well mount them once and forget about them. Just make sure you tighten the top bolt from time to time, as they might loosen up due to vibrations. It is worth noting that these are exceptionally versatile. As well as offering a secure mount for your bike they can be used to secure heavy loads and prevent them from sliding around your truck bed. This makes the INNO RT201 an attractive option. The Hollywood Racks T970 Fork Block is the master of versatility. Thanks to its simple and practical design, it can serve as an inside car rack, floor mount, wall mount, truck bed mount, whatever jingles your jollies. It’s ridiculously easy to install, and even easier to adjust. Moreover, it comes pre-assembled, so all you need to do is fix it to whatever surface you like. Speaking of fixing, the whole setup is rather heavy duty, from the skewer, through the frame and to the bolts used to hold it down to whatever flat surface you have available. Despite its durability and versatility it weighs just 12 ounces and measures 7.3 x 3.2 x 3.6 inches. That’s pretty impressive! The lightness is in part due to the fact it is made from aluminum, not steel. Granted, it’s fairly modest when it comes to capacity, as one piece holds a single bike, but then again, it’s cheap as dirt, so you can have almost four times as many T970s for the price of a single high-end rack (which will have up to four mounts for as many bikes, at most). As far as mount type goes, the T970 grabs your bike by the fork (using a 9mm skewer), so you’ll need to detach the front wheel. It does offer a surprisingly good grip on your forks; preventing movement even on the roughest of roads. This mount is designed to be fitted within just 2 minutes; making it perfect for the last minute trip. Perhaps even better is the fact that it can be used with or without bed liners. This means you can use it in virtually any truck! It is worth noting that you will struggle to fit the Top Line in a truck with a track system. If you can move the tie bars you’ll probably not be able to use this bike rack. The bike rail system can be placed anywhere in your truck bed affording you a great deal of flexibility; depending on what else you are carrying. The 2nd bike is locked to the first one through a solid bar. You can even purchase additional bars to lock a third and fourth in place! It is probably a relief to realize that this bike rack does not need you to drill your truck bed. All you need is access to the top and the bottom of the bed rail. You’ll also find the supplier gives a handy link to a pdf for instructions regarding the bike rack. A simple clamp secures over the bed rail on one side of your truck. It is important to use the gasket supplied before fitting the clamp; this will ensure your bed rail is not scratched. From this, you fasten a short bar which pivots; allowing you to secure it to the frame or seat post of your bike. 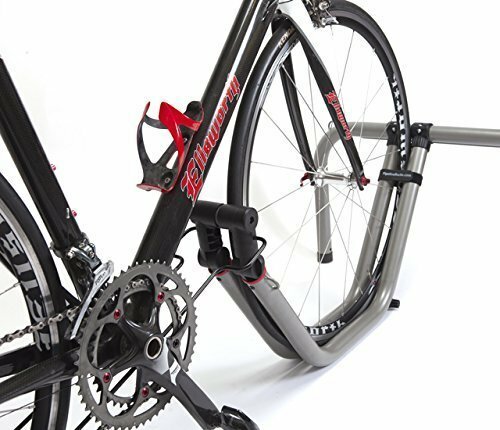 An eye on the secured mount allows you to run a security lock through the bike or bikes and fasten it to the rack mount. The locking cable is included. You may also like to know that some vehicles need a spacer when fitting the clamp. This is supplied along with a list of the vehicles that need it. A nice little extra with this bike rack is the nylon strap; this allows you to secure the front wheel of your bike or bikes; preventing them from moving while in transit. This is a great bike rack and versatile but it does not lock to your truck bed. You’ll need to keep an eye on your bikes; they are locked to the frame but the frame is not locked to anything! A final point that is worth checking before you commit to this bike rack is that in a few trucks the clamp will not fit over the bed rail. To make the bike rack fit you’ll need to drill a hole in the bed rail. A plastic cap is supplied to cover the hole when not in use. Swagman is a well established and respected name within the bike rack and accessory industry. They are known to be durable and offer value for money. 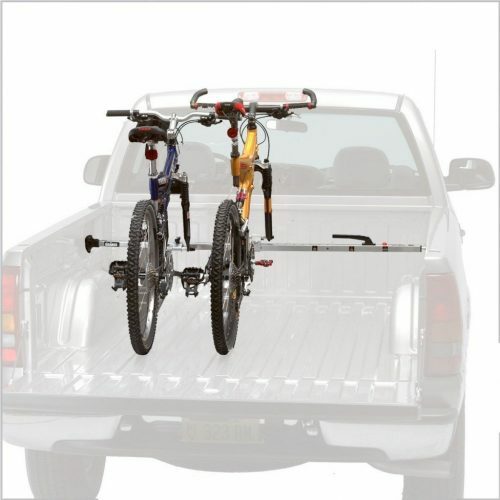 The adjustable truck bed bike rack is no different! The great thing about this truck bed bike rack is that it doesn’t look like one! It is basically an adjustable bar which is designed to fit the width of your truck bed, no matter how big or small it is. You should be able to fit this rack in just 2 minutes! The bar has rubber mounted ends. These are there to protect the paint on your truck when you slot the bike rack into place. To fit you simply adjust the width of the bar to the size of your truck. There is a quick release handle to make this adjustment simple. The ends of the bar then slot over your bed rail. These clunk into place and can be locked to ensure they are not removed by a third party. This bar should fit almost all trucks as it adjusts to the size available. To secure them you’ll need an Allen key which is supplied. You’ll also need the Swagman tool. This allows you to adjust the two fork locks positioned on the bar. There is one fork lock per bike; a maximum of two bikes can be accommodated on this rack. Once you have located the fork blocks in the right position you can slide your bike into the truck and use the quick release skewers to connect it to the fork blocks. Swagman chose the fork style mount to ensure your bike is as stable as possible while in transit. The great thing about this approach is that once you’ve installed the rack you never need tools to fit your bikes, they simply lock into position. The rack is made from steel and Swagman provides a lifetime warranty; giving you peace of mind. Of course, you need to look after the bar. If you damage the paint on it then you’ll expose the metal and this will rust over time. It doesn’t matter if you have a bed liner or not, this rack will fit and you never need to remove the wheels from your bike. The rack itself weighs just 12 pounds and it will support bikes up to 35 pounds; this should be enough for most bikes. Despite the long name, this is a bike rack worthy of consideration for your truck. It can accommodate between 1 and 4 bikes making it the perfect choice for the family or simply meeting your mates. It is important to note that this rack can only be used if your truck bed is between 52.75 inches and 73 inches wide. This will cover most trucks but check before you buy! It doesn’t matter if your truck has a liner or not; the rack will work well in either situation. It is not necessary to drill your truck when installing this rack. The rack weighs 31 pounds; one of the heaviest on this list. It measures just 15 x 15 x 25 inches and is designed specifically with your truck in mind. In fact, there is a 30-day money back guarantee if you simply don’t like it. This is on top of the standard 1-year warranty from Apex. 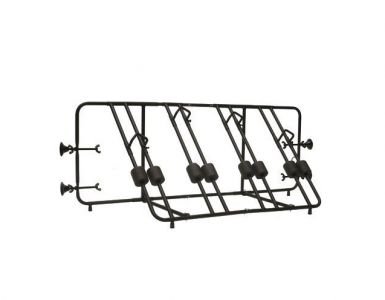 The rack is created from steel tube which has been coated black. This makes it durable but gives it a high-quality finish. You’ll also find that it is exceptionally easy to install. The rack is equipped with adjustable bolts and stoppers. The rack stands on the bed of your truck. All you need to do is unwind the stoppers until they rest against the side of your truck. It is a good idea to keep the rack central while you are doing this. There are four stoppers in total, two on each side of the truck. Once tight the outward force they exert will hold your rack in place. The Apex is designed to accommodate 4 bikes. There are four sections where the front tire slides into. Each of these has foam padding to ensure the wheel is held firmly in position and is not damaged while in the rack. A clamp, shaped as a V bracket, slots over the top of the tire to prevent it moving while in transit. The racks for your tires are designed to accommodate bikes with up to 26-inch wheels; anything bigger than that may not fit. It is essential you verify your bike before you buy the Apex rack. Although not essential it is worth considering securing the back of your bike separately. A tie-down strap is the easiest answer and will secure the rear of all the bikes, preventing them from moving while in transit. It is important to note that this rack does not have a locking system. You will also need to ensure that the stoppers are tightened firmly against the sides of your truck. 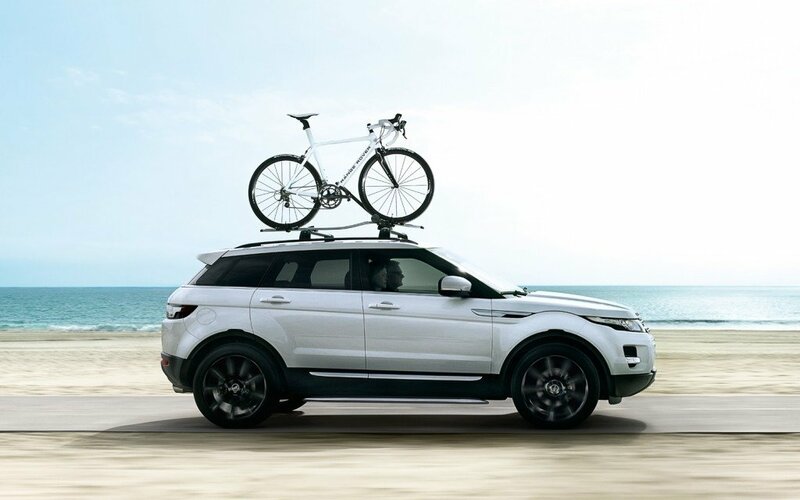 If you don’t the rack is likely to move while you’re driving which could be dangerous and will damage your bikes. This is a cool looking bike rack designed to accommodate just one bike in the rear of your truck. However, it is easy to add additional bikes. In fact, the only limit to the number of racks and bikes you can carry is the width of your truck! This rack is designed to grasp the forks of your bike. This prevents the bike from being able to twist while in transit making it safer and less likely to be damaged. In effect, this is a simple bar, designed to fit snugly across the width of your truck bed. It can be used in trucks with widths varying from 50 inches to an impressive 74 inches. There are pivoting rubber pads which will effectively stick to almost any surface. This means it can be used with a load liner or without and it won’t damage your truck. A unique feature of this bike rack is the inbuilt hydraulic pump. Simply hold the bar in the position you want it and activate the pump. It will ensure the bar is snugly fitted with the right amount of pressure. When you want to take it out there is a release switch which reduces the pressure allowing the bar to be removed. This really is a bike rack that fits in seconds with no tools and no fuss. In fact, it is my favourite of these top ten! Once locked into place you can lift your bikes into the back of your truck. There is no need to remove the wheel. Use the quick release skewers to move the fork blocks into position and then attach your bike forks. There are two fork blocks supplied with the rack allowing you to take 2 bikes. However, you can purchase additional fork blocks to increase this number. Even more impressive is that the Saris Kool bike rack is made from recyclable materials and it will not rust! It is incredibly durable and environmentally friendly. 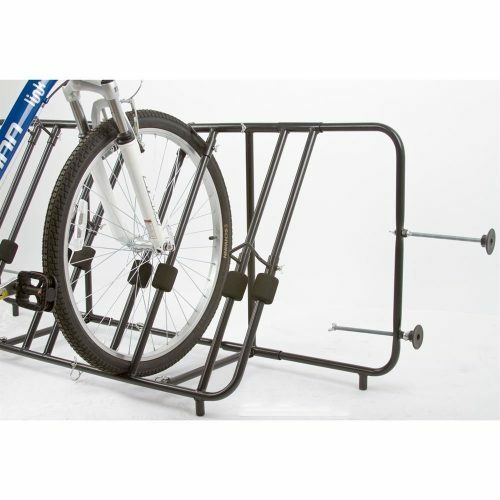 While this bike rack looks cool and is exceptionally adaptable it is worth noting that you’ll need to remove the front wheel from your bike before affixing it to the rack. This is simple if you have a quick release wheel but you still need to store the wheel somewhere; do you want it sliding round your truck bed? A benefit that is often overlooked is that this bike rack is more versatile than many; you could actually use it to secure other loads in your truck. Of course, if you choose to do this and keep the rack in your truck you’ll need to consider how safe it actually is. Currently, there is no locking mechanism on the Saris Kool. The price of a bike rack can vary according to the size of it, the style and even the manufacturer. While you want the best possible rack for your truck it is also important to consider what budget you realistically have spare to spend. If you have your heart set on a rack which is above your budget then you need to consider whether it is really worth borrowing to get it. The alternative is to wait and get it when you can afford it. Don’t forget that you need a rack which will fit in your truck bed and hold your bike securely; you should be able to do this inside almost any budget. This point should really be considered when you look at your budget. 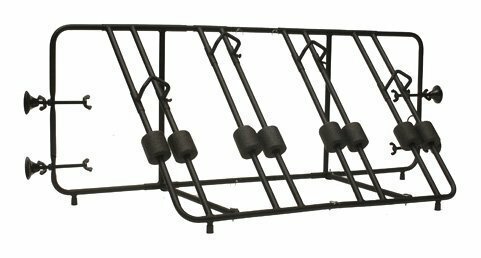 If you are looking to purchase a rack as a one-off then you really should be looking to get the cheapest one that will do the job. You may even find it is better to rent or borrow one. However, if you will be using your bike rack every weekend then you need to choose one that is durable. It is also important to consider if you’ll be leaving the rack in your truck all the time. If you won’t be then you need a rack that can be easily fitted and removed between uses. It is important to be realistic about this step; an intention to ride regularly is not the same as doing it. You may find it preferable to purchase a low budget option until you are certain that you will use the rack regularly. Most of the bike racks on this list can be adapted to carry more bikes. This may be an essential feature, depending on how often you go riding and who you go with. The obvious part is if you always go with a friend then you need to be able to handle 2 bikes. But, what if someone else wants to come along or you want to take the family out at the weekend? To ensure you have enough space for all the bikes you must consider what the maximum number is likely to be before you purchase your new rack. Some of these racks lock into the back of your truck. This makes it difficult to steal the rack. Others simply lock the bikes to the rack; creating the potential for someone to steal your bike and rack as a whole. Then there are those that offer no locking features and those that offer to lock to your truck and the ability to lock your bikes in position. There is no right or wrong answer regarding the security features of your rack. Your decision will need to be based on how often you are likely to leave your bikes unattended. If this is a regular occurrence then a locking bike rack is essential to avoid any issues. However, don’t forget that your truck will need to be left somewhere fairly isolated for a thief to take your rack or bikes. This could summarize everywhere you go cycling! If your rack doesn’t have a locking system then it is possible to lock them to your truck with a cable when needed. You’ve probably heard of most, if not all of the manufacturers on this list of the 10 best truck bed bike racks. Established manufacturers tend to have a good reputation already. However, if you decide to purchase a different style then it is important to review the reputation of the manufacturer. You need to know that you are purchasing a quality product. Social media and online forums can be a great way to get feedback from real people who have purchased the bike rack you are considering. It is important to be aware that not every comment will be positive. But, even the best businesses cannot ensure every customer is happy. Providing the majority of people are satisfied then you can assume the manufacturer is genuine and safe to use. Most bike racks are designed to be used to carry bikes; hence the name! However, this is not always the case! A rack which can be used for other things is likely to be a more attractive proposition. This is most likely to apply to the bar type racks which secure to your bed lining or use force to stay in position. In many ways, they are simply a support bar which can be used to hold items in place during transit. You need to consider whether you need a rack that doubles as a load holder. It will mean that you need to keep the rack in the truck. As we’ve already discussed this brings its own set of issues re security! Again, you’ll need to consider how often the rack will be used for other functions to decide if this is a worthwhile reason to choose a specific one. The bar bike racks take up very little room. They can easily be stored in your truck or a corner of your garage. But, some of the other racks are considerably bigger. For example, the Apex Rage Powersports TBBC-4 is a fixed unit which occupies a large area of your truck bed. When this rack is not in the truck you’ll need to consider where you are going to store it. If you don’t have space then this will not be the rack for you. It is not advisable to plan to have it in the truck all the time; there is certain to be a time when you need to take it out. You’ll be upset if you have nowhere to put it! Of course is space is not an issue or you are sure it will live in the back of your truck then you don’t need to worry about this step! Choosing the right truck bed bike rack can be an overwhelming process. There are hundreds available on the market and you don’t want to have to keep replacing them! This guide is designed to help you think about what is important in your bike rack before you select one. These are the best ones currently available on the market; there is certain to be one that will suit your needs! Don’t be swayed by the ones your friends use; their needs are different to yours. Consider carefully the various factors and then you can be certain that you have chosen the best rack for your own needs. You can then rest assured that it is money well spent and that you have a bike rack that will last you for years.